FILE - A Greek flag flutters outside the Athens stock exchange, Greece. Greek officials said Tuesday the government reached an agreement with international creditors on terms for a new bailout. Several details remained to be worked out, but the bulk of what is expected to be a $94 billion package was complete, the officials said. European Commission spokeswoman Annika Breidthardt, a key mediator of the talks, confirmed the progress on the bailout package, saying they have agreed "in principle" to broad terms. “What we have at the moment is a technical level agreement reach by the staff of the institutions and the Greek authorities on the ground following the weeks of negotiations. What we do not have at the moment is a political agreement and that it what we would need. ... [But] there are some small details that still need to be finalized," said Breidthardt. She added the final agreement requires approval from higher-level officials from the 28 EU member states. She said senior finance officials of the group would hold a conference call later Tuesday. Greek Prime Minister Alexis Tsipras has asked parliament to convene an emergency session to vote on new bailout deal late Thursday, while eurozone finance ministers are expected to meet Friday for a final decision. Greece's parliament is expected to vote on the measure by Thursday, with eurozone finance ministers potentially giving their support by Friday. Greece needs the money by August 20 when it must repay about $3.5 billion in debt to the European Central Bank. Tuesday's agreement includes setting fiscal targets with budget surpluses for the next three years, without factoring in debt payments. Greece has been in financial turmoil for more than five years and has already received two earlier bailouts totaling more than $270 billion. In exchange, the government has instituted austerity measures and sweeping economic reforms demanded by creditors. Critics of the cutbacks say the measures have gone too far and stifled Greece's already ailing economy. The European Union and International Monetary Fund agreed last month to negotiate the new bailout package after Greece edged toward defaulting on its loans. 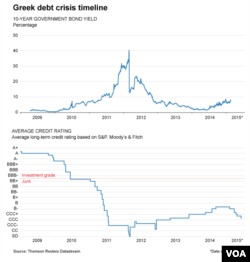 The government took several steps to try to halt the financial crisis, including closing the stock exchange for more than a month, shutting banks for three weeks and instituting limits on the amount of money Greeks could withdraw.